Though she is Mermaid, she’s journeyed with the Fire, through the door to the other side, to return with abundant gifts to share. 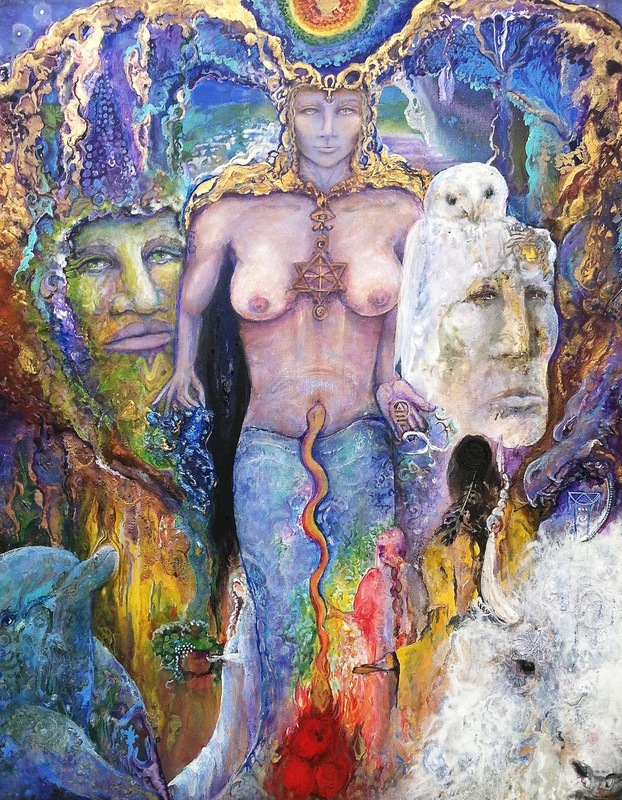 White Buffalo and Dolphin, the Green Man and White Owl Woman, all assist to hold the doors open as the Fire of transformation alchemically creates three red roses lifting the Rainbow Snake up her Chakras activating her Kundalini. At her heart is the Sisterhood of the Rainbow Rays symbol constructed of 7 sacred metals, using the Merkahbah, the Central Eye, Sun and Spirals. Above in her crown is the Anuk anchoring in the portal of visions and her minds eye sight.